I hope the dawn of a new week finds you all well. The tunes I bring you today is something surprisingly groovy I picked up last year whilst out record digging. 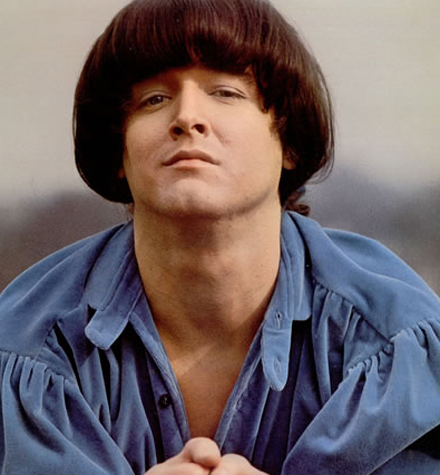 PJ Proby is one of those pop singers whose name I knew very well – he manages to pop up quite frequently in accounts of the 60s for a variety of reasons – yet who’s music eluded me completely. Despite reading about it countless times, I never heard his biggest US hit 1967s ‘Niki Hoeky’ (though I’d heard it performed by others) and all I knew about him was the famous story about how a pair of split trousers and the untimely release of his wedding tackle got him in all kinds of hot water in the UK (where he had managed to become quite successful during the British Invasion era). I still don’t know a whole lot about him, but what I’ve found out is quite interesting. Proby (nee James Marcus Smith) was born in Texas, but moved to California in the late 50s to try and become a movie star. He became friends with songwriter (and Eddie Cochran’s girlfriend) Sharon Sheeley, recorded a couple of unsuccessful 45s, and after a recommendation from Sheeley and Jackie Deshannon, made the move to the UK where he had a string of hits in 1964, 1965 and 1966. 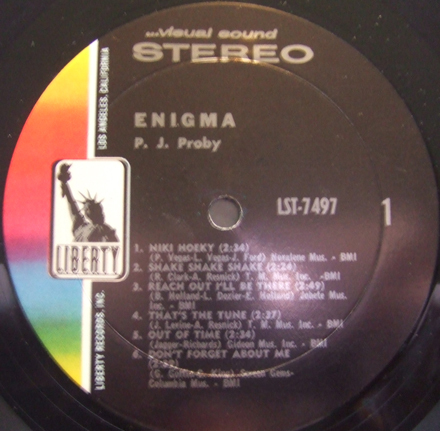 The tune I bring you today appeared on his 1966 LP ‘Enigma’, which as it turns out is really quite interesting. Composed of a variety of cover material by writers like Ashford/Simpson/Armstead, Graham Gouldman, Goffin/King, Mann/Weil, as well as well know hits like the Four Tops ‘Reach Out (I’ll Be There)’ (a pretty nice version!) and the Rolling Stones ‘Out of Time’ (also good), as well as the aforementioned ‘Niki Hoeky’. Today’s selection is a Goffin/King number called ‘Don’t Forget About Me’ that reveals Proby to have been something of a vocal chameleon. A really wonderful bit of mid-60s pop, ‘Don’t Forget About Me’ bears traces of the Wall of Sound, progressive pop and of course Proby moving back and forth between Scott Walker and Gene Pitney sounding vocals. When I first heard this record, I wasn’t sure what to make of Proby’s voice. It is quite good, and he certainly wasn’t the only vocalist of his time to bounce back and forth between two (or more) sounds. His attempts at a soulful vibe aren’t bad at all, and his pop tunes, though occasionally bordering on the histrionic (not necessarily a bad thing in moderation) are good too. The second selection ‘I’m 28’ also has a short but interesting history. It’s the kind of record that seeming couldn’t have been made at any time other than 1966, when the wall between straight pop and the underground was crumbling bit by bit. It was also recorded by Toni Basil (it’s the A-side of her sought after and extremely expensive Northern Soul 45 ‘Breakaway’) and was recorded in the UK by Friday Browne under the title ‘Getting Nowhere’. 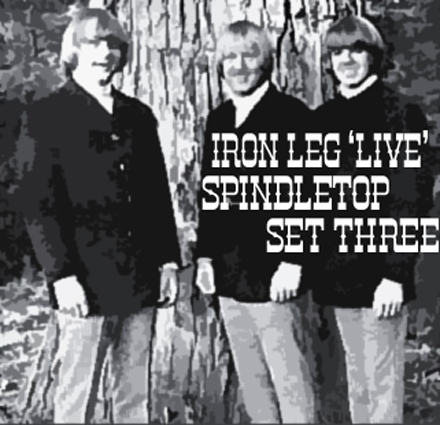 I hope everyone is digging the most recent edition of the Iron Leg Radio Show. It will of course be placed in the archive where you can pull down the ones and zeros at your leisure, whenever you feel like stuffing something groovy in your ears. 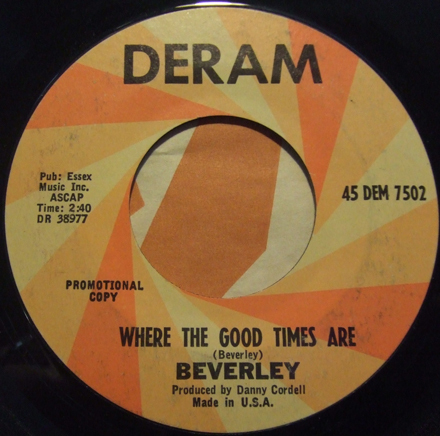 Speaking of something groovy, let’s sit down and check out ‘Where the Good Times Are’ by Beverley. This is one of those cases where it pays to keep your eyes and ears peeled, and hanging around (personally and virtually) the right people pays off. Earlier this year, my man Derek See (he of Derek’s Daily 45), who I have never met in person but have interacted with on the interwebs, and who is a record cat who I hold in high esteem, posted this very record. It good and blew my mind and got wedged in the nooks and crannies of my fevered brain where it stayed until a short while later when another one of my record pals included it on a sale list which is where I got the copy you see before you today. 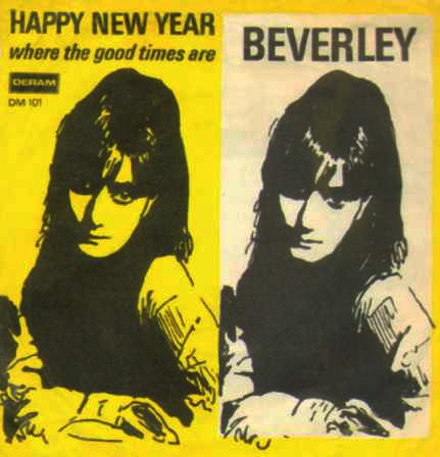 Now, if you are a fan of the storied Deram label, home to much groovy psychedelic and freakbeaty music, you will be pleased to find out (though you may very well already know) that Beverley’s ‘Where the Good Times Are’ (in actuality the much better b-side of a tune called ‘Happy New Year’) was the very first 45 issued on the label. It is – in many ways – the perfect storm of a record. First and foremost, it’s another in a long line of ‘swing on by this groovy scene’ records in which the listener is invited to fall by the coolest place around, of which there were many in the 60s (and later, of course). Kind of like Petula Clark’s ‘I Know a Place’ but 100 times cooler. Second, the record, which scores a perfect 100 points on the Grogan Freakbeat Scale (which I just invented) is a tornado of fuzzed out pop goodness, with pounding piano by Nicky Hopkins and crazed guitar by none other than James Patrick Page, who was taking a short respite from trying to conjure Beelzebub to lay down some crazed sounds on this very 45. Beverley (nee Kutner) was a veritable pop scene satellite of her time, ricocheting all over the world, appearing on the cover of Bert Jansch’s 1965 album ‘It Don’t Bother Me’, recording this 45 (and one more for Deram), meeting up with Paul Simon during his sojourn in the UK and coming to New York where she put in a cameo appearance on one of my all-time fave Simon and Garfunkel records ‘Fakin’ It’ (it is she who speaks the ‘Good Morning Mr Leitch’ line in the song), after which she returned to the UK and in 1969 became Mrs John Martyn (yes, the UK folk god) with whom she recorded several albums. She has also had her own career as a solo and a side-person, but no matter how much she did, she never (at least in my opinion), ever did anything as cool as ‘Where the Good Times Are’. Hey everybody! How about some more music? But first, I’d like to say thanks to those of you that donated during last week’s pledge drive. This year’s donations were extremely generous and as I said over at Funky16Corners, it’s very rewarding to know how much some of you dig what I do at these blogs. 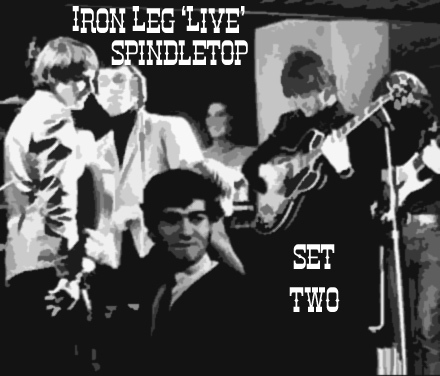 That’s right, a whole sweaty month has passed and it’s time again for the Iron Leg Radio Show, Episode the Second. I managed to keep things in and around 90 minutes this time, and it’s still packed with many groovy sounds, all of which just happen to pop. I hope you all dig it, and I’ll be back next week with something smaller and more easily digestible. PS Head over to Funky16Corners for a remembrance of the great Benny Spellman. As promised last week, today marks the beginning of the Funky16Corners Blogcasting Nerve Center and Record Vault 2011 Pledge Drive, wherein we come to you, hands outstretched (but filled with music) asking for contributions to aide the upkeep of the server space (where all of this wonderfulness resides). 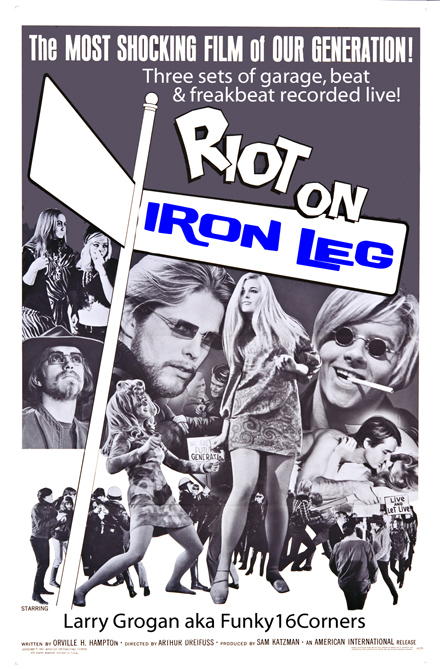 This has been going on over at the main blog for the last six years, and I had something special lined up for Iron Leg this time around, so I figured I’d close the loop as it were. 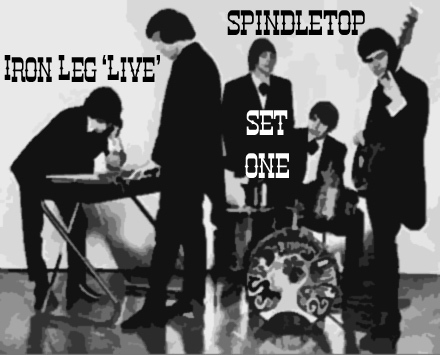 That something special is a couple hours of very groovy music (garage, UK beat, freakbeat etc) recorded live, as spun (also live) by yours truly at Spindletop @ Botanica in NYC on 5/23. I generally get inside of a funk and soul bag when I do Spindletop, but this time out our host Perry Lane allowed me to run the freak flag up the pole with a return to my own fuzz drenched roots. I’ve recounted my mid-80s garage/mod years in this space many times, and the 45s in this mix are a selection of my favorites that I started collecting back in the day (and continue to dig for to this very day). I should note that there are a couple of moments where one of the turntables seems to be having speed difficulties, but they are few and far between, and the music is hot. So, give it all a listen, and if you’re a fan of what I do here, or over at Funky16Corners (or both), click on the Paypal button (above or below) and drop a few bucks in the till. If you head over to Funky16Corners, you’ll find over seven hours of new mixes of Northern Soul, rock steady, deep soul and funk assembled by myself and some of the finest selectors I know.